“Nobody knows anything.” It’s perhaps screenwriter William Goldman’s most famous quote (second only to “my name is Inigo Montoya, you killed my father prepare to die”). Goldman was referring the fact that prior to a movie’s release, studio execs really have no idea how it is going to do. The idea is that if people knew what would work and what would flop, there’d be no bombs. Well, outside of hilarious, Producers-style scheming intentional bombs. What Goldman is really getting at is the heart of what it means to live and work in Hollywood. People sometimes ask me what, as an anthropologist, I’ve learned from ten+ years of studying the entertainment industry; and perhaps the number one lesson is that everybody, everywhere in the business, is plagued by Uncertainty. Studios don’t know whether their movie will be a hit or a flop. Screenwriters don’t know if their next script will be bought. Actors don’t know when their next gig will come. Actually, almost nobody knows when their next gig will come, not for sure. Uncertainty hangs over the head of everyone, like the sword of Damocles. But uncertainty is the situation, what’s interesting is what behavior results from it: anxiety. This anxiety caused by uncertainty is one the hallmarks of Hollywood life. It’s this fear, for example, that can sometimes lead people to do things that seem odd to outsiders – like cancelling a new TV show before it’s even aired a single episode (this has happened at least 70 times in the history of television). 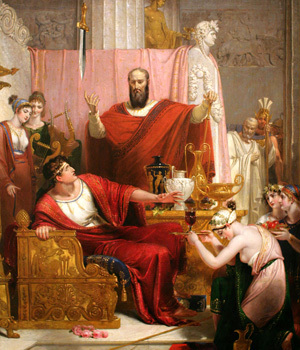 The myth of the Sword of Damocles. Moral of the story: in positions of great power and prestige, there’s always a sharp, pointy piece of uncertainty hanging over your head. Everybody seems to feel this anxiety, from the top of the industry food chain down to the bottom. But what do they do about it? Asa Boholm, writing about the anthropology of risk, said that people think about uncertainty along two lines: the probability that something will or won’t happen, and whether the stakes are high or low. So basically, if you look at a situation and decide that the stakes are low and the probability something will happen is high, you’ve got one response, and if the risks are high and the outcome uncertain, the reaction is different (he then details what those coping responses are; I won’t bore you any further with it, though). In most of Hollywood, the stakes are actually fairly well-known and pretty high: it’s your livelihood that are the stakes (or how well the movie or TV show you’re working on does, which affects your livelihood). What’s uncertain is the probability of the outcome – booking the job, whether the movie will be a hit or a flop, etc. So people come up with coping strategies to try and manage that risk; you try to schmooze all your contacts to get the job; you try and advertise the heck out of John Carter so people will go see it, etc. That’s how this anxiety translates into actual behavior: the way many people act in the entertainment industry is based on trying to mitigate that risk – to lower their uncertainty. What this means is that many people’s behavior in the industry seems to be driven, at least to some degree, by fear. One big example of this is when studios hire stars for big movies as a way to try to mitigate the risk; Arthur De Vany and David Walls published an article analyzing statistically whether having a big-name star in your movie could reduce the uncertainty of an opening, and guarantee a hit. The answer, they found, is that stars can’t guarantee a movie will open big, but they do seem to statistically insure a minimum return; in other words, they can’t guarantee that a movie will be more successful, but they can make it fail less. • Table from Artur De Vany and W. David Walls, “Uncertainty in the Movie Industry: Does Star Power Reduce the Terror of the Box Office?” Journal of Cultural Economics 23: 285–318, 1999. Congratulations! If you work in the entertainment industry, you are statistically more likely to make it big than in a regular field. Of course, you’re also more likely to completely fail. Welcome to the magic of living and working in a kurtotic system. This news comes courtesy of the absolutely-fascinating-every-single-one-of-you-should-read-it book Hollywood Economics, by Arthur De Vany. I’m not a statistician (as you’ll obviously see), but De Vany is, and the book is full of brute force statistic analysis of different aspects of the entertainment industry, including “does having a star in your movie guarantee box office?” “is the blockbuster strategy successful?” and “does luck or talent predict a strong career in the industry?” (that last one should be of interest to pretty much everybody). Now, as an anthropologist, I am loathe to rely on strictly statistical analysis of what are clearly strongly culturally-determined effects, but DeVany’s data is compelling. Statistics can’t give you an idea of the cultural reasons behind the effects they’re showing, but they are good for measuring those effects. One of the most interesting overall conclusions De Vany makes is that analyses of almost all Hollywood functions reveal that the entertainment industry is, statistically speaking, highly kurtotic (as opposed to having a standard, bell-curve-like distribution). That means that the industry is characterized by a non-standard distribution curve of resources, and is highly sensitive to nonlinear event cascades: so exceptional statistical values, both high and low, occur more frequently than in normally structured systems. Different statistical curves – note that high kurtosis (technically called “leptokurtic” here) has an unusually high peak, but also that the downslopes of the peak are lower than in a standard distribution. I know, statistics make my head hurt, too. In other words, there is an unusually large proportion of people at the bottom, and that people at the top are really at the top. And as a side benefit, seemingly small events can snowball into large outcomes more frequently than in a standard system (for example, you write a small screenplay for a webisode, someone likes it, they offer you to write an episode of a TV show, you get bigger and bigger screenwriting jobs, and eventually you’re a well-known, powerhouse screenwriter (? ), being yelled at by Mel Gibson – all originating from a single, small event). Now, things like this can certainly happen in a regular system, but in a kurtotic one, they’re more likely to happen. Figures do indeed bear this out. According to the MPAA, in 2010 the entertainment industry was responsible for $16 billion in wages in the state of California. The top ten earning actors that year made $349 million of the total $16 billion in wages – meaning 2% of the total wages were earned by roughly .0038% of the workforce. But we shouldn’t forget that there are 121,990 more actors out there; DeVany is correct about the kurtotic nature of the industry, but his analysis creates an unreasonable focus on the super-elites in the system, while ignoring the vast number of middle-class, working stiffs. A system of high kurtosis means a lot of high values, but a lot of extremely low ones as well – all the people you know or have met that are trying to make it for many years, or exist on the fringes of the industry. But hey, look at the bright side: a nonlinear event cascade could mean that any one of those people could (relatively) suddenly be unbelievably successful. In fact, the rise of the original studio heads is an excellent example of this; and it’s arguably part of the dream that has kept people coming to L.A. since the biz began. 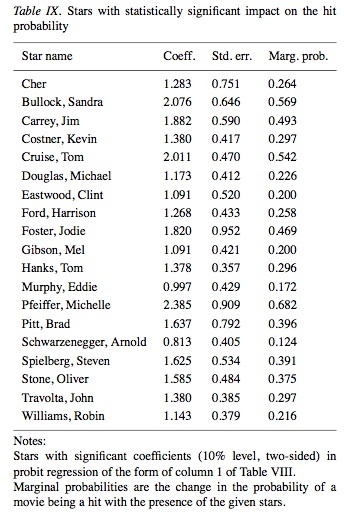 Table from “Uncertainty in the Movie Industry: Does Star Power Reduce the Terror of the Box Office?” by Arthur De Vany and W. David Walls, Journal of Cultural Economics, 23: 284-318, 1999. By the way, as an anthropologist and not a statistician, my grasp of these concepts is admittedly weak. I’m going mostly by my reading of what De Vany writes, and will welcome corrections from people with a deeper understanding of statistics than myself.